Staying in touch. Staying up to date. Staying engaged. That is what ALMA International is all about. Whether it is helping our Members to do business and to grow financially, or whether it is about presenting news and education that expands knowledge to help our Members to stay one step ahead; ALMA’s mission is the success of our Members. The ALMA Webinar series allows our corporate Member/partners to present education and information about products, technology, innovation at any time making it a timely way to reach out to the industry. This is a FREE service for our corporate Member/Partners, and FREE to attend. Audio Grounds is the 21st century equivalent to a coffee break chat. These informal online discussions will allow unscripted discussion about what is going on around the Audio, Loudspeaker & Technology Industry with peers from around the world. Bring your own beverage, and join the chat. 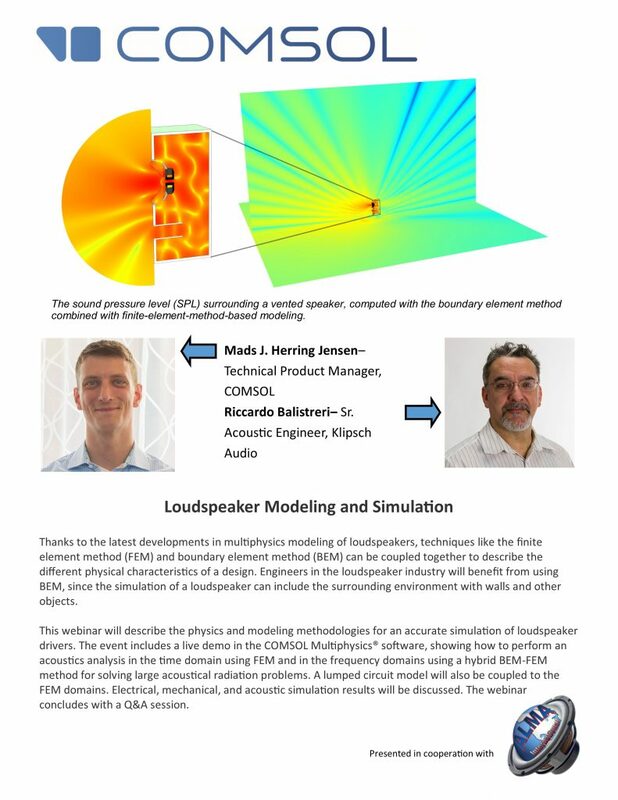 Thank-you to COMSOL, Riccardo Balistreri, and Mads J. Herring Jensen for the terrific presentation and to all who attended. Not able to make the live broadcast? Download the webinar below. This Audio Grounds Chat is over. Look for new sessions coming soon!